If you run a business and has a website, then you know that you are going up against the increased competition in your market. In the face of growing obstacles and higher chances that your business will not reach your goals, you need to look to high-quality website content to drive traffic and increase conversions. In today’s competitive market it is crucial to produce amazing web content. Without excellent content, people aren’t going to want to visit your website or care about your brand. If you want to stand out and drive more business, then you need website content that is relevant, valuable, and shareable. If customers can’t find your content, then your content won’t be useful. If your content isn’t useful, then your business won’t be able to increase conversions. In the same way, if your web content is sub-par then your customers won’t share your content. All of these consequences will impact your bottom line and the longevity of your business if you don’t prioritize and optimize your online marketing content. Why Do I Need Great Website Content For My Business? Your online presence depends on the quality of your site content. If you publish lackluster website content, then your business will suffer, and you won’t be able to turn a profit. In our fast-paced world, your business needs to capture the attention of your audience. But once you have their attention you need to make sure that your content meets a high level of quality. Anyone can produce content, but the only thing that matters in today’s competitive market is the quality of content. Since your audience has limited time consume content your business needs to produce amazing content that resonates with your customers. If you’ve been through the creation process in the past, you already know what you need to do. You’ve got to create content that’s going to resonate with every single person that comes across it. 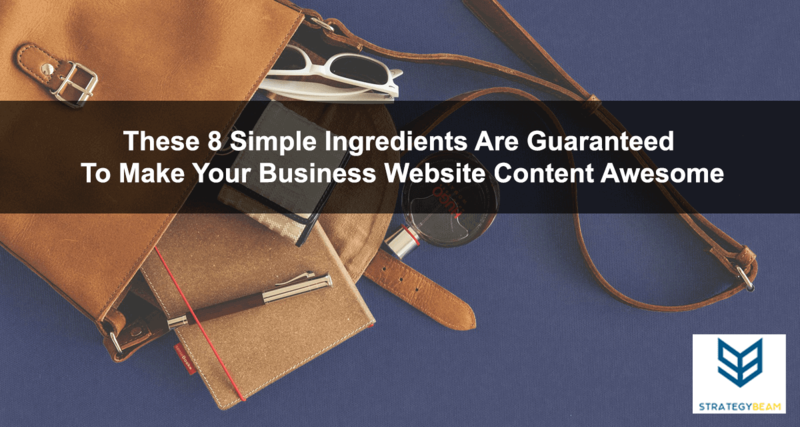 Many business owners and marketers think that there is some secret to produce amazing website content. However, the truth is that there is a proven system to generate great web content. This proven web content will get found by search engines, address the needs of your customers, and that your clients will love to share. Instead of wondering how to create valuable website content, you can follow a proven process to ensure your online content stands out from your competition. I covered some of these steps in the past, but today I want to address the myth that your business can thrive without high-quality website content. Great content will allow you to expand your online presence, and your brand will grow along with your fanbase. As your business continues to produce great web content, then your reputation will grow and so will your bottom line. Here are a few tips to help you produce great content for your website! Your business needs to get found by search engines and deliver value to your audience. The only way your company can increase your online exposure if by working with the algorithms used by Google and other search engines. The best way to do this is to integrate keywords across your website content. By using appropriate keywords throughout your website content, your business will be found in the competitive online environment. Your keywords should be utilized in a natural manner because the ultimate goal of your website content is to convert your readers into paying customers. Keywords are going to be the punching power behind your content because, without effective keywords, you wouldn’t see as much activity in regards to your website content. Be sure to follow some basic tips to find the best keywords for your business and your audience. An unprecedented amount of content is produced and published on the Internet every day. 4 million hours of YouTube content is uploaded. The sheer volume of content that is produced each day means that your business faces a torrent of content that you need to compete against. The only way for you to cut through the noise generated by this much content is to produce web content that is focused on the needs of your customers. Once you understand the needs of your customers your website content needs to have a single focus and defined purpose. If your content covers topics that are too broad, then your online content will get overwhelmed by the volume of content produced each day. If you stay on topic, you’ll hold the attention of anybody who is reading the content for a much longer period. The longer you hold their attention, the better; it means that they’ll be looking at your marketing tactics and other advertisements in the process (making you money). Your customers are consuming content through different devices with an explosion in mobile devices. If you want to remain competitive, then your business needs to produce content that can be consumed on all devices. The only way to do this is to keep your website content concise. Otherwise, you risk losing the attention of your customers as they view your online content on their mobile devices. You should know just how long an individual piece of content needs to be because people have short attention spans these days. Short and sweet website content is what your customers prefer. Now, of course, there are situations where a long and descriptive piece of content is going to be a better option; but it’s all about personal preference and the topic that your website content is based on. The success of your company depends on the authority of your brand. The quickest way to undermine the hard work you put into growing your brand is to produce website content that is not accurate. If you post a piece of content that isn’t true or is completely inaccurate, people are going to take notice. They’ll start to think that your levels of integrity (in regards to content) have begun to fall away. Start off by posting high-quality (and more importantly, truthful) content. People will not only respect you for it, but they’ll be more prone to check out the website in the future. If they can rely on you for great content, the visitors will never want to leave! Since you want your website content to be relevant to your readers, you can publish content based on popular topics. This approach will help you align your content with search terms that your customers are already searching for, so your online content will appear in search engines. If some popular event is going on, try and associate it with your content/industry. If you can do that, you’ll be bringing in a larger number of visitors through referencing. If there was some crazy event that happened at the Oscars or Grammy’s, you could look for a way to tie that game into an aspect that your business is knowledgeable about. It may seem a bit petty, but the world of Internet marketing is a tough place to succeed in. Any boost that you can get is going to be well worth it. Consistency is the key component to creating an environment that your readers will fall in love with. You should find ways to keep the tone, message, and publishing schedule consistent. Ensuring that your online content stays constant means that your audience will know what to expect and this will help you gain recognition to keep a competitive advantage over your competition. When your customers can expect an interesting blog post or video from your company each Wednesday, they’re going to start marking it on their schedule. This type of expectation will make your business fit into the daily routine, and that helps integrate your company into the lives of your audience. Consistency is, even more, key when you’re building a blog because it allows visitors to look forward to the posts you’ll be making. Not only will this generate more traffic, but it will create dedicated fans (which is the best kind, of course). If you aren’t getting the job done properly, don’t be afraid to hire a writer. I know it can be tough to let somebody else handle such an important task, but that’s what they are equipped to do. Every single portion of your website doesn’t have to be hand-crafted, and as a matter of fact, many people just use third-party services to put everything together (all the way from the design of the website itself, down to the content being posted). If you’re in it for the money and not creative freedom, hiring professional writers will always stay ideal. I know you want to save as much money as possible for your business. But the truth is that your website content is one of the most important aspects of your company to grow your online presence and increase sales. Don’t opt for the cheapest content writer because your audience will notice. You should only work with an experienced freelance website content writer who has the experience necessary to develop excellent content for your business. The content writer you hire should have a strong background in digital marketing and has worked with several channels other than website content. This will help your business because your site content writer will produce content that will work with your entire marketing strategy. A holistic perspective on your marketing strategy will help align your business goals across your entire brand. If a writer has an amazing portfolio, with plenty of past projects that are high quality, you should expect to pay for their service. The most successful online businesses view their website content as an investment instead of a cost. If you want to succeed online and grow your business, then you should take a similar approach. Quality content is longer an option for your business. Your readers have more choices than ever to address their needs and answer their questions. With the overwhelming volume of content produced every day, your business is up against a lot of media competing for the attention of your customers. If your business wants to thrive, you will need to produce quality content that your readers will love. If your website content is relevant and valuable, then your online audience will share the content with their social networks and increase your exposure.